Keeping up with Landree: It's beginning look a lot like Christmas! It's beginning look a lot like Christmas! I am getting so excited about Christmas! At the grocery store tonight they told me they are doing a holiday preview party tomorrow night and Santa will be there! I think we are going to go to get Landree warmed up to him. We are having Santa pictures taken on Saturday and I don't want her to be scared of him. Here is her picture with him last year, and while she never cried she didn't crack a smile! On the way home from the grocery store she did say Santa is coming to her house-we've never told her this! They learn so quickly! Our town Christmas tree lighting will be on December 4th, hopefully we'll be able to go to story time with Mrs. Santa again, and the Lights before Christmas at the Zoo, and when we're in TX we plan to take Landree to Holiday in the Park and an Ice exhibit at the Gaylord. I am so excited that she will really be able to understand things this year! We don't need any more toys and I want to create lots of fun memories for her and teach her the real meaning of Christmas. She already randomly sings Happy Birthday. Tonight she was singing and I told her soon it will be baby Jesus Birthday. I have started some of my shopping-can't share too many details because gift recipients might be reading. This doesn't include my sister in law J or her children because she won't send me a list. Hint Hint! How about you? Have you started shopping? What are you buying this year? I've noticed several people who have started showing their decorations on their blogs. I am going to be sharing a few of my new favorite finds soon! Let me know if you have a new favorite something too! Cute picture! Landree will be so much fun this year! I have started Christmas shopping, and the kids are getting bean bags for their new rooms. We decorate the day after Thanksgiving. I can't wait! LOL - I am done with shopping and I generally am by Thanksgiving. I love to decorate and enjoy the holidays. My Christmas tradition is high tea at the RitzCarlton. I took PIT last year (only we couldn't get in at the Ritz and went to the Hyatt) and it was a ton of fun! 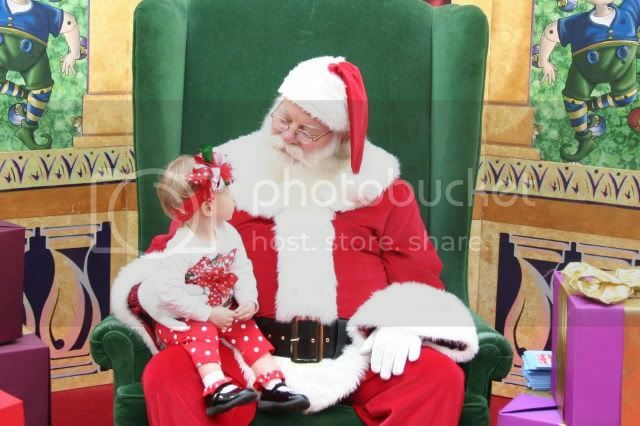 The photo of Landree with Santa lastyear is so cute. Sofia screamed her head off last year, so hopefully this year will be quieter for us (lol). I really need to get staretd with the shopping. I have purchased a few things, but need to finish. I can't wait to see Landree's Santa photo this year.